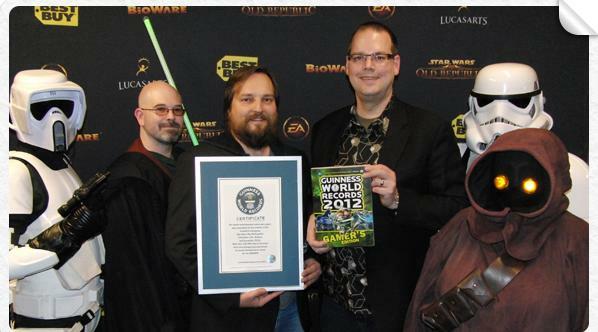 Star Wars: The Old Republic has been officially recognized by Guinness World Records which is a very cool honor indeed. Just shortly after its launch on December 20, 2011, the popular MMO was awarded a spot in the latest Guinness World Records 2012 Gamer’s Edition. The big title? the Largest Entertainment Voice Over Project ever. Because the record is such an awesome one, it received a full 2-page spread in the book, which I try to get every year because it’s great fun to read and have around. Here you will find a tribute to 30 years of Star Wars gaming with fun facts, new records, figures and more – all about Star Wars.